Tuffy says: An Afternoon Affair is SOLD. Here is a nice big blue mare that Rick has been trying to get his hands on for the last few years. And now he has her! She is not our traditional Hancock bred mare. She has such greats as ALAMITOS BAR as her grandpa on the sire side and she is a granddaughter of SHI BAR SKIP & JET DECK on her dams side. We really think this mare will put some size on her babies that some of our clients are asking for. She is broke broke, fast fast and pretty pretty! She has the best dispostion and is so easy to work with. 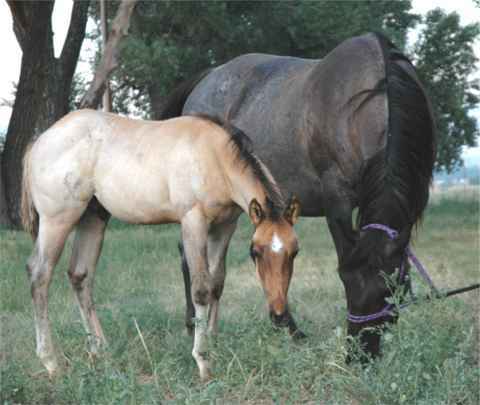 She is pictured here with her 2005 dun roan colt at her side and is bred for a 2007 foal.THANK YOU KIM & ELDEN!! !